We can change the way we think and be transformed by the renewing of our minds by learning more about God. We can learn more about His ways from His Word. And we can learn more about ourselves as we examine our hearts and discover ways we can grow, improve, and change for the better. How about you? What are your thoughts about changing the way you think so you can become more aligned with God and His best for you? Share below and bless others. Hey, friends. Susan Gregory here. And I hope you are already experiencing an amazing Daniel Fast or you’re considering it for your life. 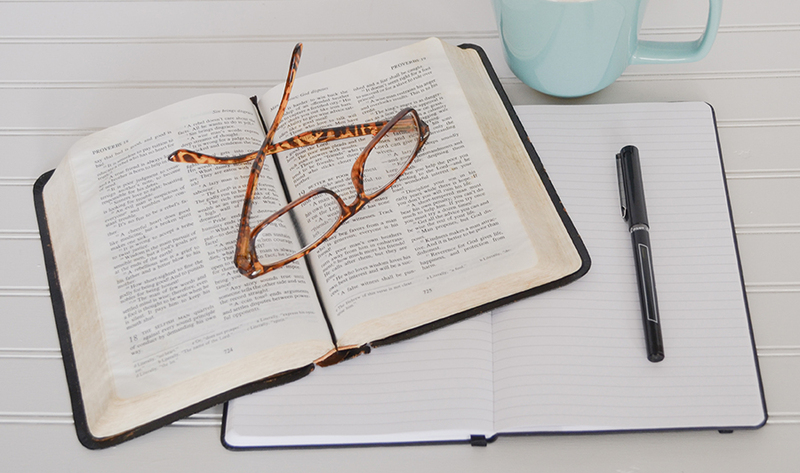 Maybe you’re starting to prepare, but one of the things that is so powerful about the Daniel Fast is that you can discover more about God, more about His word, and more about yourself. As I said, I’m Susan Gregory. I’m the author of The Daniel Fast: Feed Your Soul, Strengthen Your Spirit, and Renew Your Body. That is a book that’s available at all online and local bookstores, so you can look at that, and it gives a great overview of the fast. It also includes a full Daniel Fast cookbook and a 21-day Daniel Fast devotional, so I hope that you have an opportunity to maybe pick up a copy of that. But today, I want to talk with you about what is available to you. There is a huge realm available to everyone who has accepted Christ as their savior, who has given Christ their lives. This is an opportunity for you to open your mind, to say and give yourself to the Lord and say to Him, “Lord, I want to learn from you.” So make the decision that this is a time that you want to learn, and decide to step into kingdom thinking. What is kingdom thinking? That is His way of thinking. Decide to investigate God’s kingdom reality. There is the way of the world, and then there is the way of the kingdom. If you start getting that perspective and really look at the scriptures through that lens, you will see that, from Genesis through Revelation, that God is showing us the difference, and how we have the choice. Do we want to stay living in a worldly way, or do we want to transfer and change the way we think, change the way we behave, change what we believe, so that we can live a kingdom of God existence? Then you can decide that God is who He says He is, and decide to believe God’s word as the final authority. And then you get to decide to learn about yourself. So there is this door that is available to you. Now, what are the things that will keep that door shut from you? First, it’s focusing on the flesh, and that’s why I keep telling people, when they use the Daniel Fast, don’t make it about the food. When you make the Daniel Fast about the food, you’re continuing to focus on your flesh, trying to satisfy your flesh. I can’t tell you the number of people that I have heard from over the years … I’ve been teaching about the Daniel Fast since 2007, and the number of people who have told me, “Susan, I missed it. I focused on the food and I missed on all of the blessings and the insights that God had for me.” But now, they’re learning the different way. So you can learn that now. Keep your meals simple. Don’t focus on the food because when you do, you’re focusing on the flesh. That’s called carnal thinking. The carnal mind cannot receive the deep things of God. Paul says to the carnal people … He was speaking to Christians, and he said, “I couldn’t teach you the deep things. I could only give you milk. I couldn’t give you the meat because you had a carnal mind. You were babes in Christ.” You don’t want to do that. You want to put aside the flesh, crucify the flesh so that you can learn about the deep things of God. Now part of the flesh is pride and ego. The Word says that pride goes before the fall, so get out of the prideful thinking. Get out of fleshly thinking. Get out of carnal thinking. Get out of that mindset. I already know that. There will be things that you will read, and you say, “Oh, wait. I’ve already read that.” But go deep with those things. Go deep with that thought. Don’t say, “Oh, I already know that.” That will keep the door to great, amazing insights closed to you, so you don’t want a closed mind. And the final thing that I want to talk about right now is what would keep the door shut, is when you get stuck on the traditions of men rather than the truth of God. We always want to go to God’s word to find out the truth. That’s why you want to learn how to meditate on His word. What is He saying? Not necessarily what the church has been preaching, what the traditions of men have said. Now, I’m not saying that that’s all bad. It really isn’t all bad. There’s a lot of great stuff, but you know what? There’s a lot of stuff that is not consistent with the truth of God, so that’s why you always want to use God’s word as the final authority. It is His word. That means that you can feed on Him, that He will teach you, He will show you. But what do we need to do? We need to knock on that door, that means when we make the decision to enter in. And then, we need to hear from Him. We need to put away fleshly ways, carnal ways, and lift up the spiritual part of us, be present in the spirit, and hear using our spiritual ears to hear from Him. That means quieting ourselves, slowing things down. So behold, I stand at the door and knock. If anyone hears my voice and opens the door … So that’s what we want to do, open the door to his truths. It says he will come into him and dine with him and he with me. Dining is a very personal thing, an intimate thing, a joyful thing. And He will do that. So what’s on the other side of the door? God’s revelation. He will speak to you. He will show you His truths and ways that you may never have experienced before. This is when we hear with our spiritual ears, see with our spiritual eyes. You will have God’s direction for your life. You will be able to ask Him questions and have Him hear your prayers, and He will show you. He will guide you. He will direct you. You have God’s favor for you to experience, walk in His favor. You are His precious child. He cherishes you. You’re the apple of his eye, and you can walk in that favor when you live by the Spirit. When you walk in the Spirit. When you choose to stay on this side of the door. And then you have access to His blessings. You have access to God’s kingdom, and this is your new life in Christ. All things have passed away. All things are new. There is that old way of thinking, that old, worldly, fleshly way of thinking, behaving, being, or there is the kingdom of God lifestyle, and it is available to you. It all comes with a choice. So now you can learn more about God. You can learn about His character. How does He think? What does He think of you? The word teaches us that God is so far beyond us, there’s no way we can understand Him. And that is the truth. He is so huge, we can’t ever fully understand him. But you know what? He does not hide Himself from us. He wants us to understand Him. He will show himself to us, and that’s why we want to draw near to Him. His word says that he rewards those who diligently seek Him. And then, you get to discover more about His ways. What is the Christian life? What does it mean to walk in the spirit? What does it mean to be in Christ? Those are all things that you can discover, that you can learn about, as you draw nearer to God, as you spend time with Him, as you meditate on His word. And then you know what? You get to learn and discover more about yourself, the treasure that you have in you. God created you. He fashioned you. He made you with purpose. He treasures you. He loves you. You can learn more about yourself, and you can start seeing things in yourself that you want to change, those little tweaks that you want to make, so that you can be more like Christ. All of this is available to you, this wide-open door, when you choose to open your heart to Him. To discover His ways, and to learn more about yourself. Now, do you want to learn more about this? 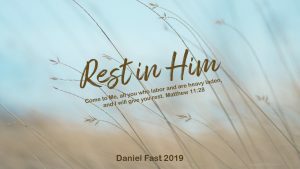 If you’d like to enter the Daniel Fast and learn how you can really enter His rest, you can go to Daniel-Fast.com/rest, or click on the link below. I’d love to stay connected with you. Go ahead, share this video with people that you know that could use this message. Subscribe to this channel, and leave your comments. We love to hear from you. Blessings to you. I hope the very best for you on your Daniel Fast, this time when you can stand at the door and knock and He will open that door for you. You can learn from Him. You can dine with Him and He with you. What a blessing. Thanks for all your messages and words of wisdom. This was my first time doing the Daniel fast. Focus on the Lord and not the food. Keep your meals simple and your prayers in the expectation that your Father loves you and hears you. Entendo ser de Deus este projeto, estarei iniciando hj meu Jejum, disposta a alcançar a maior e mais profunda intimidade com Deus. I understand that this project is from God, I will be initiating my Fast, ready to reach the deepest and deepest intimacy with God. Be blessed on your fast, Elisangela. Susan, I have just joined the Daniel Fast. I’m 70 years old and have recently lost my sweet husband of 46 years to incompetence of Drs. It has put my life in a tail spin and I want to come out of that spin. I want God to be back in control of my life and I want to be that light for Him. I was saved when I was 10 yrs old, but I’ve let circumstances come between me and Him. I pray this course is everything you say because I truly need and want Christ to live through me. I’m ready to surrender to Him. Thank you for this opportunity. I look forward to dying to self and learn more about God and His will for my life in my latter years. God Bless! Know for sure that your Lord wants the very best for you. He treasures you. And He is delighted that you have a deep desire to get to know Him and His ways better . . . and then walk and live in the Spirit. I’m so glad you’re with us. Keep your eyes on Christ. Develop your faith. And hold the hand of your Father as He leads you in this part of your life journey. Be blessed and thanks for your powerful message. This was my second Daniel Fast. My first was your first. The timing was right for this second one. It has given me both spiritual and health rewards. Thank you. Praise God, Martha. God is so very good and His Word promises that God will reward those who diligently seek Him. You’ve experienced His rewards and there is so much more to come! Hi! I wanted to ask about not thinking about food too much. Where is the boundary? I have to think about it so that I dont break from the rules, and when I prepare something. May God always watch over you! You are right, we do need to think about food as we plan, prepare, and consume. I encourage you to enter into giving thanks as you think food. Thank God for the creation of you. Thank Him for creating nutritious foods to nourish your body. Thank Him that you have food. And thank Him for the life-giving process that takes place in your body when you make wise food choices. The “boundary” is when you’re thinking about food in an obsessive manner. Cravings. Deprivation. Loss. Stay nourished. Be thankful. Praise God for the work He is doing in you! 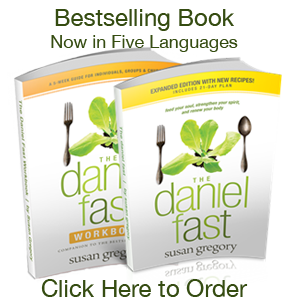 Susan, thanks sooo much for this outstanding and Godly way of explaining the real meaning of the Daniel Fast. I like a few of your other respondents was focused on the food aspect and not the true meaning of getting closer to God. I’ve been on the fast for 2 days and have not really thought about food at all. I have been fasting once a year at the beginning of the over the last 3 years. My prayer time is spent worshiping God and all that he has done for me and my family. He just keeps on showing strong in my life as I just witness him performing a miracle just yesterday. Without giving a lot of detail I can rightfully say that I’m headed toward being debt free 2 years faster than I predicted. God is sooo good. In closing my prayer is that God will continue to keep you and protect you as you continue to give out your daily words of Hope and Encouragement. Thank you so much for taking the time to write and share your powerful message of God’s blessing in your life. I receive your blessing, friend. Thank you again and be blessed as you continue to grow in the love and knowledge of our Lord. Hi, may the Lord keep blessing you in everything in His ways. I was trying write down as my bible study but your closed caption goes so fast, I’m hard of hearing/read lips that’s why. I hope this helps! Be blessed, dear one! Hello, Susan. Greetings to you in Jesús name. I just finished my yearly new year fast with my praying group and I personally want to have a fast to connect with God. I have this thing that God is calling me deeper to but don’t know how to go about it. I have done Daniel Fast but feel guilty that am eating much. It seems God is calling you to a deeper conversation with Him. You might consider personal time of prayer and fasting. Perhaps a 3-4 day water-only fast. God knows your heart. He wants to give you the direction you’re seeking from Him. Get yourself in a quiet, focused place so you can hear from Him. Expect to receive . . . and He will deliver. Be blessed and thanks for your message. I am really struggling with my fast this year. Not with the fast itself but the challenges I am facing each day. It seems they are ever increasing and I cannot seem to find solutions. I keep hoping and trusting God to come through for me, give me light on my path, but it seems my hope keeps getting disappointed. I know God is faithful and has perfect timing, but my faith is really weakening as I canNot seem to focus on God because the challenges are at the forefront and keep pushing to the fore of my focus. Here is what I have discovered . . . there are some lessons we can only learn in the times of challenge. I’m not saying God is creating the challenges for you. However, I do encourage you to look for the lessons from God in the midst of the challenges. Also, declare the goodness and truth of God over your life and the circumstances. What does God say about the situation? What does the enemy say about the situation? And then, what will you say about the situation? Be like Jesus and say only what your Father says and do only what your Father says to do. Take charge by being bold with your faith. Expect the kingdom of heaven to invade the situation. Remember, ask, then believe you receive, THEN you will get it. Believe that the solutions are already yours. Give praise. And then with patience (faith-filled confidence) await the manifestation. The enemy is a defeated foe! The victory is already yours! Praise The Lord Jesus. Thank you for this message. Sometimes I think about food, it was like this that I was told to eat lunch food at dinner. I said can’t eat. When I heard your message I said what I did. I’m wrong Lord, forgives me. I should walk in the spirit. Yes, I want to learn more about God and more about me, as growing strong in Christ. I feel fall down but I know God lift me up. He loves me. Susan, thank you Lord Jesus you in my life, thank you. God bless. God loves you more than you can imagine, Nalini. Believe in that love. Learn about God and His Word. And then apply it to your life. You will always be better for practicing the ways of the Lord. You will have the peace and rest that your heart desires. The point you made is a life lesson we can use always. The more we can focus on the Lord and less about ourselves, the greater joy, peace, love, and security we experience. It’s all from Him rather than us having to strive for it! Thanks Susan once again for this amazing journey. Did my first one in 2008 with my church. I usually try to do it twice per year. I started my Fast on 1/4/19. Things are going well and I am enjoying Resting In Him. Your encouragement through your teachings are appreciated. May you be richly blessed as you share His Word during the Daniel Fast. Thank you for your very loving and encouraging message. Our Father is so very good. He has more for us than we can perceive with our natural thinking. Discovering Him in His Word and through the revelations He provides is so very valuable. Be blessed on your fast. And thank you again. I’m so glad you find value in Rest in Him. The feedback has been so positive. Lives changes. Faith strengthened. God is so good. Thank you so much for your encouragement. This is my 2nd year on the Daniel Fast. I was ready this year than last year. 3 of us girlfriends started our fasting. We pray to start & finish strong, in Jesus name! Thank you & blessings to you Susan! I am so happy for you. God has so much in store for you. Believe you receive! Expect great things! I hope the very best for you and your friends on the fast! I have fasted before but this is my first time with an online support thank you 🙏🏾 for doing this and being obedient to the Lord calling you to teach this! This is my desire to hear Him and obey.. I eat pretty clean normally no meat or dairy so I have also added my attitude to not complain and to allow the Lord to crucify my flesh to surrender more to Him. Thank you for your message, Kimberly. You are so very welcome. I praise God every day for giving me this work. He blesses me in more ways than I can count as I am able to serve His people. Be blessed on your fast . . . I hope the very best for you. I’ve done Daniel Fast for a few years now but this year is the one year that I have really decided to put my all in it and not focus so much on the food, so I can hear God. I am more focused than ever reading and study his words daily. My faith has been shakened but I know I’m going to be just fine because he says I am. Thank you Susan for your tips and readings. Yes, we will be shaken as we grow and get stronger. Also, there are some lessons we can only learn in those times of stretching and wonder. Praise God. He is always available to us and wants to show us His ways and guide us into His peace. Thank you Susan Gregory May the Lord continue to bless your Ministry!!! Oh, Cynthia! I am so sorry for the break in your write. I broke my wrist many years ago! Argh! So inconvenient, right? I receive your blessing and I hope the best for you on your fast. Hi Susan, Thank you for obedience and commitment to the Daniel Fast. Just knowing that you are still available is very comforting and reassuring. I’m on a diet now because of my health. But I want to do more than just lose weight. I want God to be a part of this process. I need my health so I can continue to do His work as much as I can. I know God loves and He wants the best for His daughter. He has never changed. I have. So I am grabbing this opportunity to strengthen my relationship with Him through this fast. Thank you and have a blessed day. Austra. Thank you for your wonderful message of hope and intentions to draw nearer to God. He is so very good and has insights, blessings, and direction of our lives. Be blessed as you continue to grow in the love and knowledge if Jesus! Expect great things from Him and stay in faith! God constantly astounds me- and I thought I knew Him! Doing the readings and worksheets of the Daniel Fast are inspiring, uplifting and thought provoking. I decided to stand on His truth for each day and not listen to the evil one or the world kingdom-I decided to hand over ALL of what is an issue in my life ( small niggly issues and bigger issues) and had to smile when He answered a prayer I had made on the way to work, at work, shortly after i had arrived. I admitted to Him that my responses to the situation were not according to His way and asked Him to change my way of dealing with the situation, Thank you Lord that I am a work in progress and there is more to learn and many blessings to come. The victory is yours, Alison! Our God is so good. We can live a different life and walk in His blessings, favor, and rest. I’m so happy for you. I can “hear” your inner joy and the chuckling of your heart! The joy of the Lord! Praise God! Hello, Thank you for allowing me to share my comment. I don’t know much about the bible, God’s word, but I am ready to start learning, reading, and fasting. Thanks a lot, Susan for all your help! I was in your place once. I can only sum up learning about the amazing life we can have with God as “stunning.” Early on I had times of questioning and wondering if the amazing life He offers could be true. Now, after countless miracles, blessings, and “out of this world” experiences, I am fully convinced that He is who He says He is, He will always fulfill His promises when we put our faith in Him, and that He loves me more than I can ever measure. The same is all available to you! Step in and learn. He is amazing. Thanks for your post. I’m so happy for you! Thanks for your message. God is so very good. Yes, there are other methods of fasting, including liquid fasts. However, I would suggest you review the Daniel Fast guidelines, and then because of your health needs modify the fast. You may need to add chicken or fish since grains can be an issue. I don’t teach about other types of fasting. However, I do encourage people to use the Daniel Fast as their base, and then make modifications for health reasons. I so get your message, Carol. Our God gives more than we can ever imagine in blessings, insights, direction, and LIFE! Loved your words. You are so right on! Keep leaning into God . . . and learn about what the scriptures teach us about crucifying the flesh! Less of you. More of Him.